Road warrior Gargano comes out with a tight guard inviting Davies in, Davies handling the opening round with his jab. Couple of left hooks to the body the highlight for Davies. The second round, the big right hand that Gargano likes to load up on finds a home a couple of times, but again Davies has a solid handling on the proceedings. In the third round a couple of left hooks from Davies on the ropes land, but Gargano starts to showboat - winding the right arm around, giving the Ali shuffle in the middle of the ring and trying to draw Davies in, but the round ends with a nice uppercut from Davies. In the fourth, Gargano starts with some 'wooooing' to the crowd, Davies starts to target the body as Gargano keeps the guard high. The round ends on some good exchanges and the two embrace mid ring. Referee Chaz Coakley scored the bout 40-37 to Davies who goes to 6-0 in his career. Preedy has a vocal support and comes out in his southpaw stance. A nice counter left early from Preedy. The first round brightens up nicely as Jackson pins Preedy to the ropes and lands some clean shots, catching Preedy when he comes in. Preedy would be well served to use his long reach, but seems intent on making the fight range. In the second that suits Jackson fine as he looks to roughen up Preedy, catching him flush with a left hook and then looks to roughen him up inside. Preedy comes back strongly through, firing off in the ropes as Jackson fires back himself to finish a cracking second round. Early in the third the hair of Jackson comes undone, causing a slight delay. The hair starts to go as wild as the fight, swinging about alongside the punches. It's not good enough though, and trainer Michael Balingall takes the scissors to it to the applause of the crowd! The fight is back on and Preedy seems to have benefitted from the rest, landing some nice straight lefts. In the fourth a cut opens over the left eye of Jackson after the two get in close on the ropes, a head clash starting the wound that leaves blood on the back of Preedy. It seems to ignite the two, who once again open up on each other as the round ends from what was an entertaining fight. Referee Chaz Coakley scored the bout 39-37 In favour of Preedy who goes 2-0. The man with the best ring name in boxing, the Mathamagician Rahmood, opens the round wel with a solid left hook to the body. Sashov feels it and backs up, Mahmood follows across the ring and again lands the same shot to drop his opponent early on. He's up at eight, but he's clearly hurt. Mahmood goes back to the same shot, again dropping Sashov but is then told off by the referee for pulling down. In the second round Mahmood is concentrating on the left to the body which Sashov is wary of. He targets both sides of the body, landing solid punches. Sashov is varying his stance to try and stop the onslaught, but Mahmood continues where perhaps he should be varying the shots. At the start of the third round a nice right overhand by Mahmood sees Sashov fall to a knee but he doesn't quite touch the canvas, to the confusion of those in and out the ring. Mahmood comes straight back for him and puts him down properly. He gets up, only to find Mahmood again on top of him and it's a big left hand to the head that drops Sashov. He beats the count, but the referee correctly decides he isn't in a state to continue and waves this off. Referee Kieran McCann stops the bout at 2:32 of round number three for the winner Mahmood. Mendes in phenomenal shape here. He looks athletic as he circles the ring, using the right hook well out of the southpaw stance. He seems reluctant to use the left hand but when he does it opens spaces to utilise the hooks and uppercuts. Mendes boxes well off the back foot in the second, again trying to bring Hrazdira into range to unload the left hand but his opponent is too wily to fall for it. The third round again Mendes is looking for the right hook but passes without too much action. In the fourth a Mendes uppercut, on the back of it Hrzdira drops his gloves and laughs, allows Mendes to throw a jab and smiles at him. The round is paused as a change of gloves is required for Mendes. It finishes with Mendes in control. In the fifth again Mendes suffers with his glove, needing the attention of the corner and a new glove. In the sixth a nice left hook to the body is followed by a right up top by Mendes but it draws nothing but a smile from Hrazdira as he keeps approaching. Referee Ian John-Lewis scores the bout 60-54 to Mendes who carries on his good run of form. Pattison in control through the first round. A nice jab, keeping control of the ring from Pattison as he controls the tempo of the bout. In the second a solid right hand to the body from Pattison, Mehmed unable to land when he comes forward. He does cover well though from the Pattison hooks to the body. More feeling out from the two, Pattison easily controlling. A nice combination in the third from Pattison, left hook to the body followed by the right uppercut and a right hand over the top which brightens the crowd up. The fourth passed without note. In the fifth the highlight is a nice left hook that Pattison lands with a follow up right hand just on the bell. The sixth starts well, Mehmed landing a nice uppercut but Pattison landing some nice straight rights. There is blood coming from the nose of Pattison, but he lands a nice right over the top as Mehmed comes in. As the round is closing and Mehmed is tiring a big left hook from Pattison, which leave Mehmed spitting out his gum shield which looks on purpose. It gets replaced and gives Mehmed some recovery time, enough to see him through to the final bell. 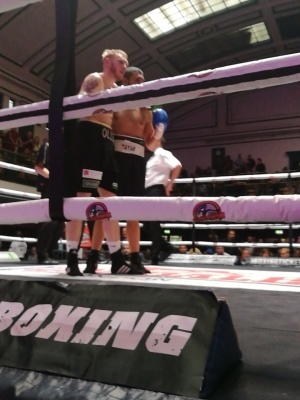 Referee Kieran McCann scores the bout 58-57 to the winner Pattison. Walker starts off with some nice working from angles, stepping to the side to open gaps up and throwing some nice combinations. The highlight though is a solid straight right that breaks the Hortavic guard and rocks his head back. A nice step to the left at the start of the second round opens a gap for a good Walker left hand, followed by the right. Walker is showing a good ability to make his own angles. Hortavic comes back looking for the left hook but Walker is fleet footed enough to be out of the way and when he does get caught up with, can plant his feet and pull out a rear uppercut. In the final round Walker lands a left hook that is deemed a slip, but Hortavic looks troubled, his gum shield coming out straight after. The round ends scrappily, Hortavic pinning Walker to the ropes, but Walker doing the cleaner work. 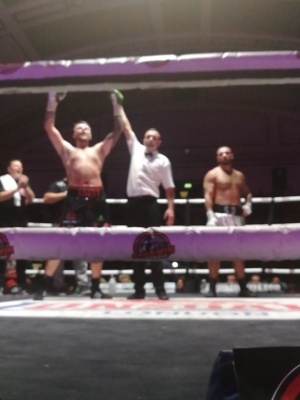 Referee Ian John-Lewis scored the bout 39-37 to winner Ryan Walker who goes to 4-0. An uneventful first round, the two unwilling to engage one another. A bit scrappy as the two fall to the floor together. Beardon dominates well in the second, the jab effective in keeping McCauley at distance. There are times McCauley rushes into the attacks but Beardon does well to cover and hold. The third is quiet, but in the fourth they start to really engage. A tussle mid ring seesa solid straight right from Beardon land but McCauley is happy to exchange. He catches a glancing overhand right of his own, before the two stand and trade flurries in the centre. A big left hook from McCauley sees Beardon start to circle off, looking to slow the pace down. A big straight right from Beardon and a flush left hook, but McCauley has seen it a before and laughs it off to see the fight out. Referee Chaz Coakley scores the bout 40-37 to winner Charlie Beardon who moves to 3-0. Greenidge has a very impressive following with him tonight making his debut. Nice lead uppercut from Greenidge early on in the corner, Zankov happy to take the back foot here. A nice left hook, straight right from Greenidge sends his crowd into a frenzy. Very composed performance for a debut here, nice footwork controlling the ring. A cut has opened early on the left eye of Zankov, who swings a left hook that Greenidge rolls smartly out the way of to end the round. Highlight of the third round sees Greenidge step right to open an angle for an uppercut before stepping back to his left and swap hands to land again. The round ends with a big straight Greenidge right to the head. The final round, Zankov opens well with a good right hand that Greenidge takes well. Zankov starts to showboat on the ropes but Greenidge doesn't take the bait. The pace slows down, Zankov bloodied around the eye and Greenidge seemingly content with what ha been a very good debut performance. 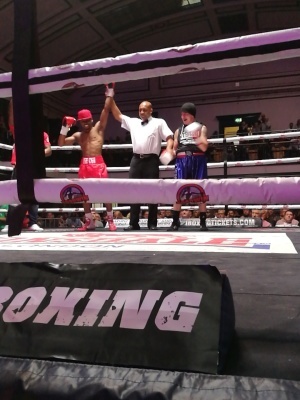 The referee Chaz Coakley scored the bout 40-37 in favour of Greenidge to the delight of a vocal home crowd. An impressive first round for Dillon, landing a crushing right hand that sends Hemsley to the canvas. He looks spent here, but somehow makes his way back to his feet to beat the count. In the second, Dillon looks to push the pace of the fight and starts to target the body, which has now marked up around the waist band as some spiteful hooks come in. In the third Diillon is getting the better of this with ease, hard uppercuts coming in and still working those body shots. In the fourth Dillon again shows the more ambition, those rear uppercuts ripping through the Hemsley defence. He is unable though to follow up on that first round display of power as the round closes off. Dillon moves to 3-0 with a 40-35 points victory as scored by referee Kieran McCann. Heavens out with his loud Brentford support in the balcony. Solid first round from Heavens, able to fire off body hooks that find a home on the Green ribs. A solid jab, Green kept at length. In the second Greene starts to show a bit ore ambition throwing some wide right hands coming in. However Heavens is still firmly controlling the bout, working well off that quick jab that although Greene can parry at times, is effective enough. The third carries a similar tempo, Heavens using his longer reach to control centre ring, Greene retreating throughout. In the final round Heavens keeps pushing that jab into Green's face, Ho is unable to find a way around it to land back. Heavens is wise not to over reach with his attacks or over commit, seeing the fight through to a solid victory. Referee Chaz Coakley scores the fight 40-36 to the winner Ricky Heavens. A cagey first round, Udofia looks to weigh up the Dumetz attack, a couple of counter rights finding a home. Dumetz does the better work on the inside of a tight round. In the second round Dumetz starts to target the body, Udofia trying to land counters as the awkward Dumetz comes forward. A solid left hook from Dumetz lands on the chin of Udofia as the highlight of the round, but Udofia does the more consistent clean work. Lovely right hand from Udofia catches Dumetz coming in at the start of the third. The two battle at close range along the ropes through the round, difficult to see which shots are finding a home. In the fourth a cut opens over the Udofia left eye, seemingly from a clash of heads. Udofia lands some heavy right uppercuts as Dumetz comes forward, a handful of times Udofia does well to turn Dumetz in the corner and do his own work. Dumetz comes out busy again in the fifth but Udofia is so composed when the pressure is on, again waiting for his opening to turn Dumetz which he does with ease and sends Dumetz into the ropes, landing a lead uppercut that rocks Dumetz. Dumetz tried to fire back, but is caught by a beautiful right hook from Udofia that seems to have Dumetz out on his feet. Udofia throws again but Dumetz is down. The referee sees immediately that the fight is over, Udofia waiting for confirmation before celebrating. 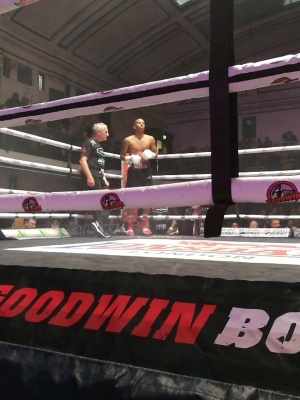 1:08 seconds of the fifth round, referee Chaz Coakley calls a stop to the action for the winner by stoppage, Linus Udofia. Slow starting round here between two men who are renowned for their ability to bang. Camacho towers over Jervier and uses that long jab to make Jervier circle the ring. The second is surprisingly quiet still neither man wanting to commit to their attacks, possibly wary of what may be coming back. The third, Camacho is trying to keep the jab going while Jervier is looking to get inside, but neither are having things their own way. Through four it is surprising how little either man will let their hands go, failing to ignite in the way many had anticipated. A clipping right off the jaw of Camacho from Jervier, but Jervier is off balance so can't follow it up. The fifth passes without much more action. In the sixth the two start the round in close quarters and Camacho lands an ice right hand. He throws a flurry of jabs that allows a big left hand through in a nice combination. Jervier though lands a big right hand that shakes Camacho centre ring that ends the sixth round. In the seventh, Jervier seems to be tiring and Camacho seems to be wanting him to come forward, dropping the hands and trying to bring Jervier forward. Into the eighth and the pair are tiring more, a nice Camacho uppercut to start the round in close. A good left hook from Jervier to end the round. The ninth starts with them both putting their all in, throwing hard inside hooks and uppercuts to varying success. the big shot of the round though comes from Jervier who shoots a right hook clean off the Camacho jaw and he looks hurt before the bell goes to end the round. In the final round Camacho really tries to stick behind the jab but some nice clean shots come in from Jervier that trouble Camacho. You sense neither has the energy to really put an end to this now - a close fight that could go either way. Jervier perhaps with the harder, cleaner shots - Camacho with the more technical boxing display. 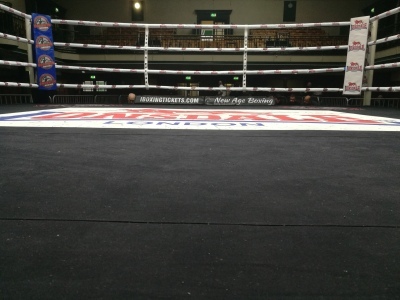 Referee Ian John-Lewis scored the bout 97-95 to the winner and still southern Area cruiserweight champion Wadi Camacho. Ogunniya impressive in the first round, constantly the aggressor. Nice control of distance, but unable to put a dent in the slippery Grannum. The second, Grannum slips a number of jabs well, Ogunniya again taking the front foot to control tempo of the fight. 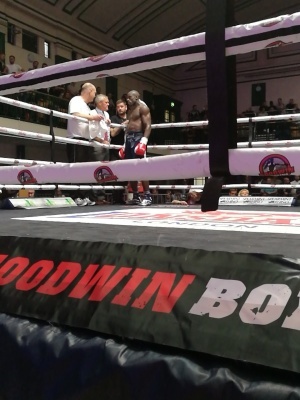 In the third, it erupts towards the end of the round as Grrannum steps on the gas a bit, landing some crisp uppercuts and hooks, before letting Ogunniya escape. It sparks Ogguniya into action and the two trade to end the round. An exciting final round between the two, trading body hooks on the ropes firing uppercuts at one another. It's hard to tell who has the cleaner work, but both are having a real go at this in the final round. Referee Ian John-Lewis scores the bout 40-36 to Ogunniya. Overhand right from Greene in the first round with a left uppercut is a nice start to the fight, but Kiwitt is sharp and lands two hooks to the body. The two spend the majority of the round trading punches, Kiwittt targeting the body with lefts and rights. Hugely enjoyable opening. The next two go in a similar fashion, each happy to plant their feet and trade big shots, neither seemingly having the power to really deter the other. The fight is so hard to call, the two unable to be separated. Both are happy to do their work on the toes of the other, meaning that rounds fly by in a flurry of hooks to the body by both men, uppercuts being launched into. The cleaner work seems to be coming from Kiwitt in the mid rounds, while Greene is maybe busier. A nice right uppercut left hook from Greene in the eighth sparks the fight and he lands a nice right hand later in the round. Greene seems to be asserting himself as the round progresses. Kiwitt himself though gets fired up, pounding uppercuts in and turning Greene on the ropes as the round ends. When the two give themselves some more room to box in the ninth there are some nice skills on display. Kiwitt rolls a left hook nicely to land a counter right. The left eye of Kiwitt is swollen up by the final round, treated heavily in the corner. A good left hook counter from Kiwitt early in the final round, Greene takes it well. The round ends in the same style as the fight, two men giving everything in the pocket of one another, with neither having the requisite power to put the other off. 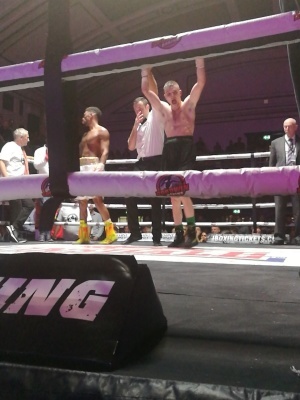 Referee Kieran McCann scored the bout 97-95 to the new Southern Area champion Louis Greene in a bout that really could have gone either way. Shinkwin returning to action here against a game Perkovic. Some big shots thrown by Perkovic through the opening rounds that Shinkwin does well to block and cover. By return though he is doing the classier work of the two, although unable to put his combinations together through the early stages. Shinkwin is clearly the classier of the two through the middle rounds catching shots on the gloves, keeping the Perkovic shots at bay while working his own jab and some classy counter. A nice right hand off the ropes catches Perkovic. The fifth ends with the two eye balling one another mid ring. The sixth is uneventful, a good showing by both lads. Referee Chaz Coakley scores the bout 59-55 for Miles Shinkwin. Demetriou is the far shorter of these two, looking to utilise that squat frame to buzz around Couzens then unload his big shots. Couzens though does well to evade the bombs coming into him. Demetriou ducks so low though that it's difficult to jab, Couzens having to adapt his shots here. Through the second Couzens again is looking to keep the fight at length, switching his stance between orthodox and southpaw. More ducking from Demetriou, the Couzens shots going over the guard of Demetriou and connecting to the head. The two have a brilliant exchange in the corner, a big left hook by Couzens getting through and a right hand, Demetrious then returning with a swinging right as they both show solid chins. Demetriou in the fourth seems to be reaching for his shots, Couzens footwork getting him out of range with ease. The big height difference makes Demetriou easy to pick off for Couzens as he comes in. Good right hand by Demetriou, then he backs himself in a corner, looking to draw in Couzens as the bell goes. In round five the height issue is evident again as Demetriou slips reaching for a shot onto the canvas. Demetriou has the rare success in the round with single shots, but it is clearly Couzens with the better boxing. In the sixth A nice lead uppercut from Demetriou, Couzens starts to then take the front foot, peppering jabs off Demetriou. Right at the end of the round a leaping Demetriou attack is met by a right hand hook by Couzens timed perfectly that sends Demetriou to the canvas. He looks in trouble on his knees, just beating the count but it's a struggle on the bell. In round seven Couzens can sense the damage he has already done. However he shows real patience in his work. A beautiful left hook to the body by Couzens sees Demetiou wince, a right to the head by Couzens rocking him back. Credit to Couzens here for his patience and not rushing to look for a finish. Round eight, Demetiou is starting to let his hands go more often again but with limited success. However he quickly tires and Couzens controls off a slick jab. Demetriou loses the gum shield towards the end of the round as Couzens is firmly on top. A few second brought, he looks to be running out of steam as Couzens dominates. The ninth is slowed down, both men seemingly running out of fuel. It suits Couzens more though, able to handle things at distance with that solid jab, whereas Demetriou's reaching attacks are struggling with the tiredness. Demetriou in the final round tries to up his work rate, rushing into the range of Couzens who is happy to cover, hold and turn. A solid left counter hook from Couzens lands clean before he goes back to sitting behind the jab to finish the fight in the same style that he has controlled the majority of this fight. Credit must go to Demetriou too, who saw the final bell in a tough nights work. 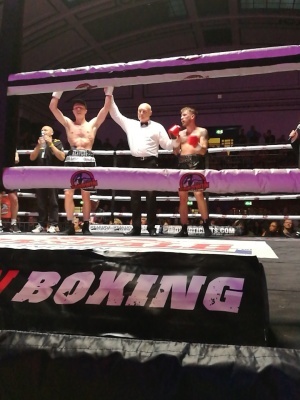 Referee Keiran McCann scored the bout 98-91 in a clear points victory for a controlled Couzens. There were two further bouts, Oli Edwards versus Dan Blackwell and Sam Barron vs Michal Ciach, but unfortunately due to time constraints I was unable to see these.